According to Pancreatic Cancer Action Network, pancreatic cancer is indeed on the rise. Deaths caused by pancreatic cancer surpassed breast cancer a few years ago. Pancreatic cancer remains on track to overtake colorectal cancer to move to the second leading cause of cancer-related deaths in the United States around 2020. Alex Trebek, the longtime host of the classic trivia television show “Jeopardy!”, recently announced that he has Stage IV pancreatic cancer. Although he intends to beat it, and let’s hope he does, the odds are against him. The disease is known for its low survival rates. It has been estimated that only about 9 percent of patients who are found to have the disease survive the next five years. So, what should we know about this deadly disease? Cigarette Smoking: Cigarette smoking doubles the risk of pancreatic cancer. Age: Over 80% of pancreatic cancers develop between the ages of 60 and 80 years. Race: Pancreatic cancer is more common in the African American population than it is in the white population. Gender: Cancer of the pancreas is more common in men than in women. Religious Background: Pancreatic cancer is proportionally more common in Ashkenazi Jews than the rest of the population. Diabetes: Long-standing adult-onset diabetes also increases the risk of this cancer. Obesity: Obesity significantly increases the risk of pancreatic cancer. Diet: Diets high in meats, cholesterol, fried foods and nitrosamines may increase risk. Genetics: a number of inherited cancer syndromes increase the risk of this cancer. These include the breast cancer syndrome (BRCA2 and PALB2), among several other inherited syndromes. Put out that cigarette for good! The risk of pancreatic cancer drops close to normal in people who quit smoking. Simply put, cigarette smoking is the leading preventable cause of pancreatic cancer. Lose that excess weight! Believe it or not, it has been estimated that 8% of cancers are related to obesity. Alter your diet and decrease consumption of meats, foods high in cholesterol, fried foods and nitrosamines – these are found in foods preserved with nitrates. Examples include cured meats, primarily cooked bacon; beer; some cheeses; nonfat dry milk; and sometimes fish. 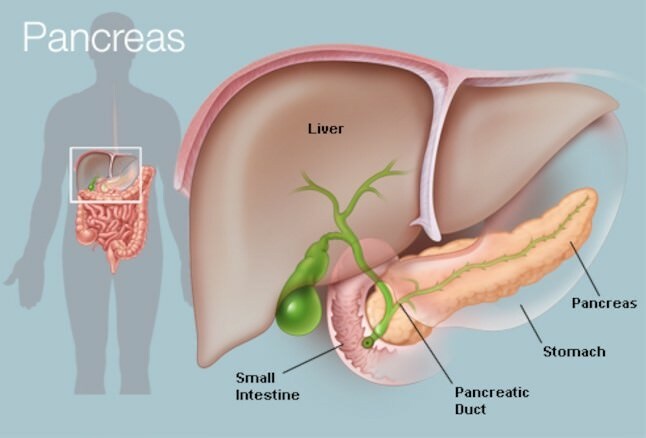 Pain (usually in the abdomen or back), weight loss, jaundice (yellowing of the skin and/or eyes) with or without itching, loss of appetite, nausea, change in stool, pancreatitis and recent-onset diabetes are symptoms that may indicate pancreatic cancer. If you are experiencing one or more of these symptoms, we urge you to speak to your doctor immediately and reference pancreatic cancer.